Long Beach students were proud to show off their medals after they set out to sea on Sept. 12 during the annual Surfers Healing Surf Camp. 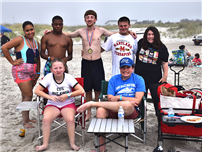 This safe and inspiring setting for surfing brought members of Long Beach High School’s Life Skills program and the district’s special education program together with students from neighboring schools for an extraordinary ocean experience. At Anchor Beach in Lido Beach, professional Surfers Healing instructors fit participants for life jackets and brought them into the water on long boards. Students put trust and confidence in themselves and their instructors as they stood up on the boards and rode waves back to the shore. Student volunteers from Long Beach High School handed out medals and offered encouragement to their peers. Surfers Healing seeks to enhance the lives of children and teens with special needs, specifically those with autism. The organization’s stellar team, coupled with the ocean’s therapeutic effect has been making a difference in the lives of its participants for 18 years. This was one of many one-day Surfers Healing camps held across the nation and was organized in partnership with the Town of Hempstead.